Rod Brown is our good amigo from Wrangell, AK. He’s already made two trips to see us this year and was one of the guys who was able to post up a nice wahoo in what has been the best wahoo week in two years! Captain Jorge helps with the photo. Captain Gerardo lends a hand to Jeanette and “Big Jimmy” Lee Gilman from Utah. 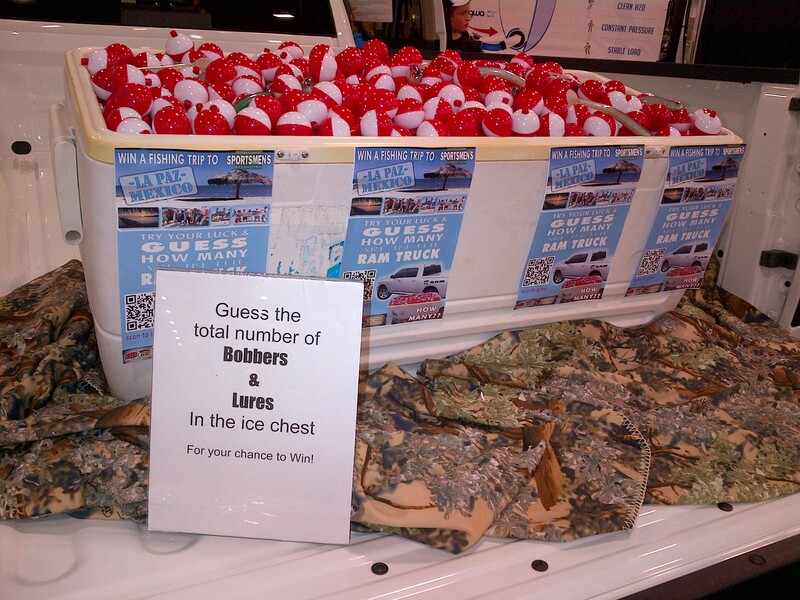 First timers to fish with us, they won the trip by guessing how many bobbers were in the ice chest photo below when they came to the ISE Sportsmans show in Salt Lake City, UT last March! 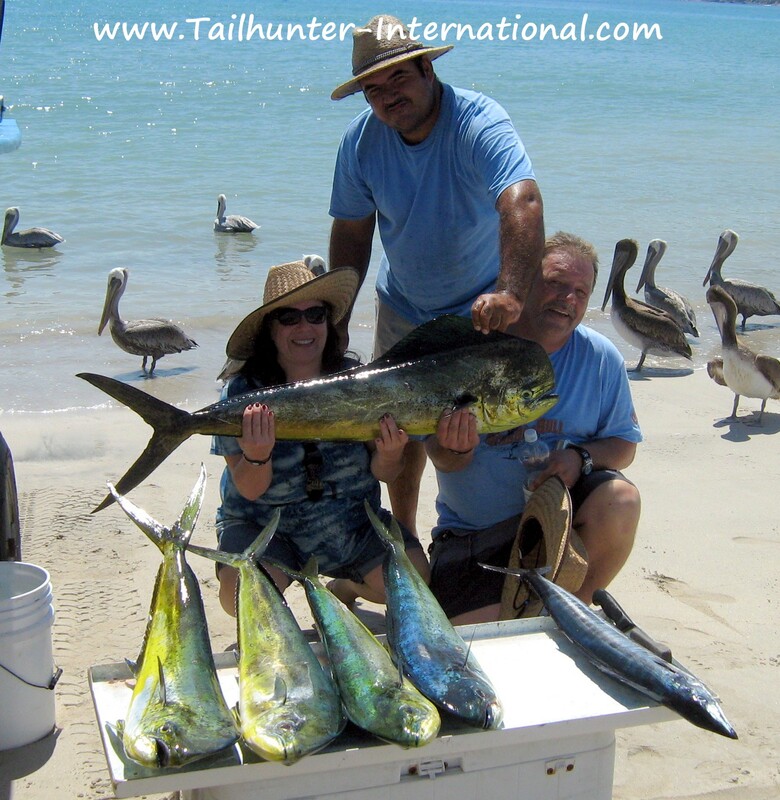 Talk about beginner’s luck…they got 5 nice dorado, a wahoo AND….two roosterfish that went 40-50 pounds! And outstanding day for anyone! 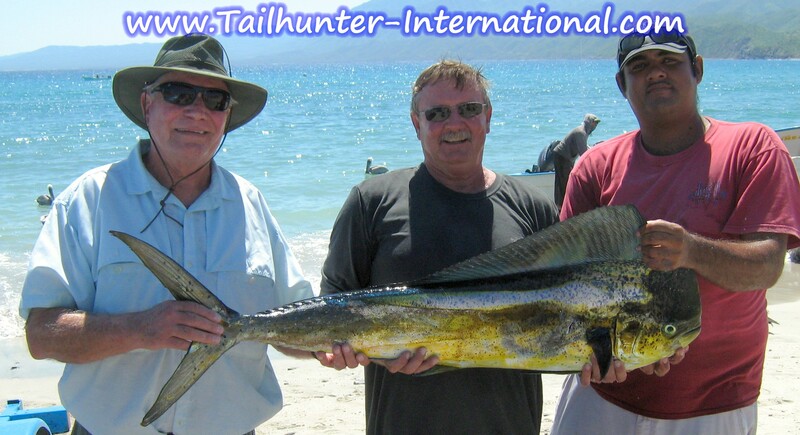 Lee Gillman in the photo above attended the Salt Lake City International Sportsmens Show in March and correctly guessed that there were 1934 bobbers in the marine ice chest above and won a 5 day/ 4 nights/ 2 days fishing trip with Tailhunter here in La Paz. Hank Gonzalez and Captain Lorenzo flank happy angler, Robert “Blue” Nuss with his personal best bull dorado he caught out of Bahia de Los Muertos. It was a pretty good week for sailfish! Chris Pallemaerts from Washington gets his buddy Josh to give him a hand with this big sailfish he caught fishing our Tailhunter La Paz fleet north of the city. They attempted to release the fish but were unable to revive it after it swallowed the hook. They donated the fish. 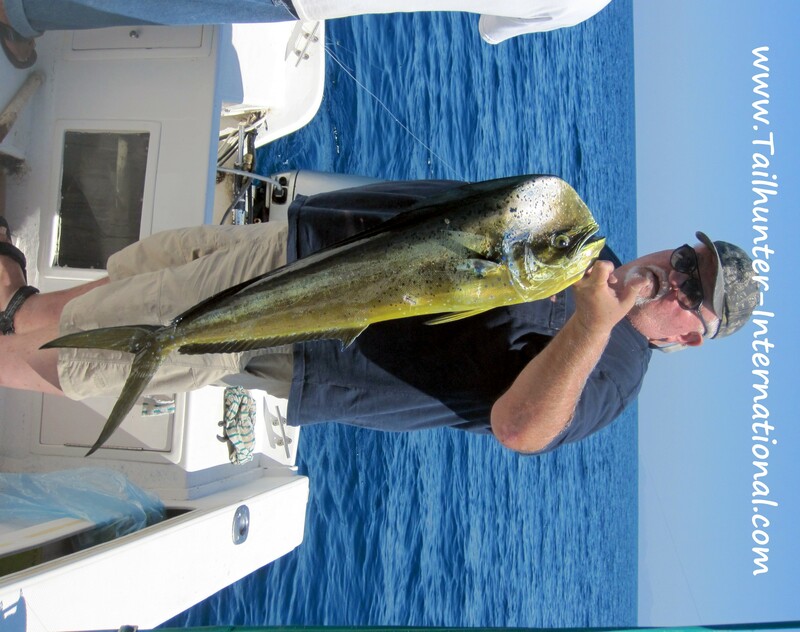 Our amigo, Charlie Gibson from Northern California, is here on his 2nd trip to La Paz this year and shows off one of his dorado he caught fishing with our Tailhunter La Paz fleet north of the city. Talk about a great day! Joe Hussin barely had a line in the water off Punta Perrico when he got his first wahoo! Then, in the next hour, he caught 2 more of the nice ‘hoo’s! Three wahoo in an hour! Best of the year so far. We had quite a few of our amigos who were on their 2nd trip of the year to La Paz to visit us including Leif Dover who lives in Atlanta GA and “commutes” to Hong Kong, China for work! 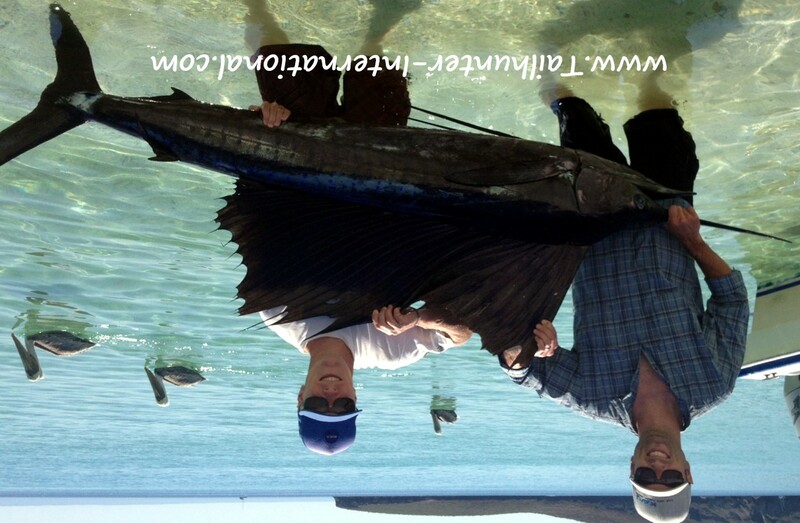 Leif crossed “sailfish” off his bucket list with his first ever sailfish fishing with Captain Pancho off Las Arenas. The fish was released. It’s always great when the kids get their first fish! 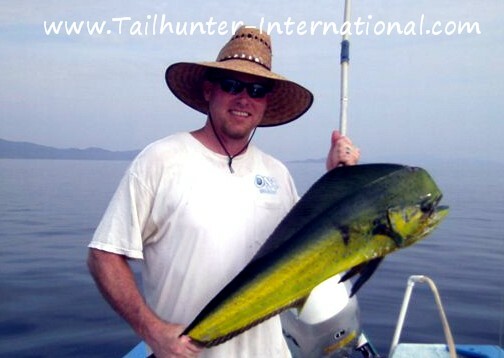 Check out the two dorado that Julian Valdez caught out of Bahia de Los Muertos! Felicidades, amigo! 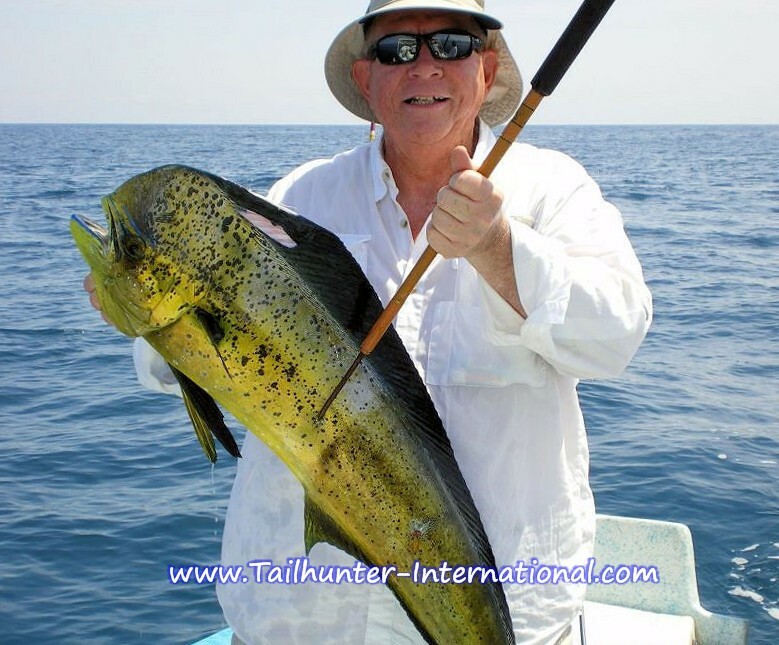 Curt Desjardins from Temecula CA was fishing with us for the first time and pulled this beautiful bull dorado while fishing with our Tailhunter Las Arenas fleet. FISHING ATTEMPTS TO REBOUND AFTER LAST WEEK’S STORMS WITH WAHOO DORADO BILLFISH! A week after we were hit with a hurricane, an earthquake and and floods from a tropical storm, things got back a little more to normal this past week. Temperatures and skies could not have been prettier. Definitely spectacular postcard-pretty weather. However, the waters are taking a little longer to get back on track as runoff from the big rains cooled some areas of water or made it greener or murkier. But, as the week went on it steadily got better although fishing still did not get up to where it usually is this time of year. The biggest danger was just fishing 1 days. You COULD be the one or two boats that didn’t do well while the rest of the fleet was hooking fish. Every day, about 80 percent of the boats did OK to good and a few just couldn’t get on the bite. So, if you only fished one day, you did stand the chance of getting only a fish or two. On the other hand, fortunately, most of our clients are here fishing 2, 3, 4 or more days and by the end of the trip, even with a slow day or two, they left with an ice chest of fillets and good Kodak moments! There was no shortage of variety that’s for sure. I think things are changing. Of course, we had the usual dorado bite where probably 70 percent of this week’s bite were dorado. Fish ranged in the 10-15 pound class, but there were larger fish up to 40 pounds well. The problem was that there was no rhyme or reason as to where the fish would bite or why they would bite one day and not the next. One “hot” captain would just smoke the fish and the next day that same captain could not get a single biter! Or vise versa. A captain on a slump would suddenly be the king of the beach the next day. 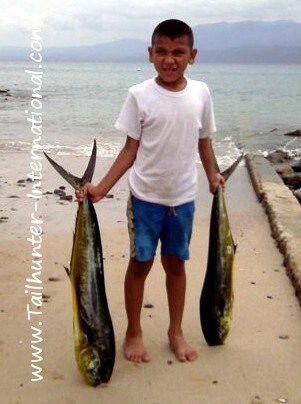 But, in addition to the dorado, we also saw our best week of wahoo. Get this. Some of the wahoo were smaller than big sierra! I have NEVER seen some wahoo so small. They were like miniature wahoo. I’ had never seen 5 pound wahoo! So, don’t get too excited. But there were also some 20-30 pounders as well. 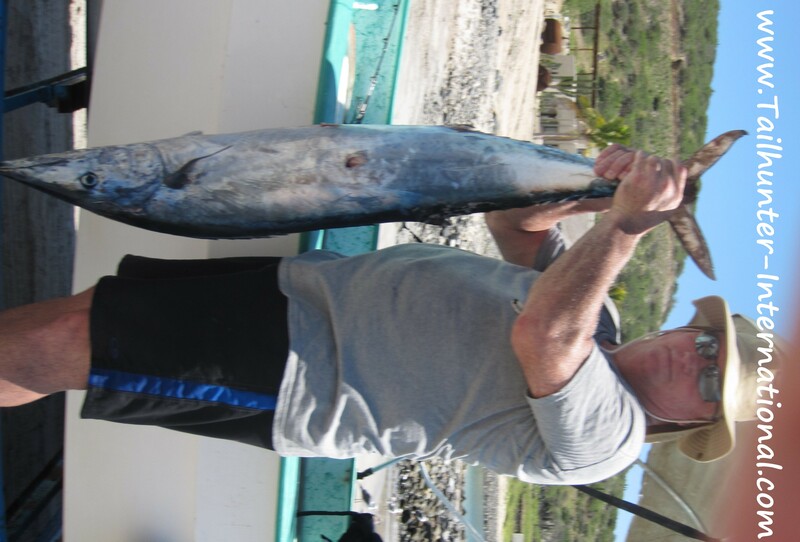 Again, like before, some of our pangas would hit the wahoo off Punta Perico and then the next day everyone would go to that spot and they would get skunked. It was hit or miss, but given we’ve not had any wahoo for 2 seasons, we got more wahoo this week than in the past 2 years combined. There were also some other good biters as well. Roosterfish are still prowling the shallows near the beaches and we got and released roosters in the 5-50 pound class all on live bait. Larger baits produced larger fish! There were also pargo, sierra, jack crevalle, lots of bonito and a stray tuna or two. Additionally, it was a good week for sailfish and marlin with several being hooked each day and most released.